Front door: Remove the front inner fender as needed (A). 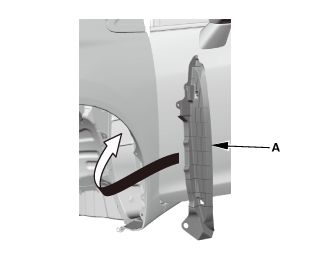 From the wheel arch, detach the clips (A, B). Release the hooks (A) securing the front fender fairing (B). Remove the front fender fairing (A). 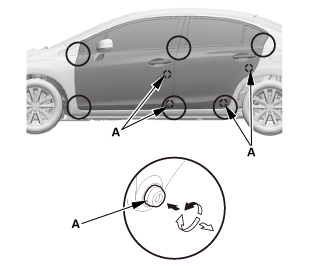 NOTE: Check for a flush fit with the body, then check for equal gaps between the front and rear doors, and between the doors, and the body. Check that the door and body edges are parallel. Pad a floor jack with shop towels, then use the jack to support the door while adjusting it. Loosen the hinge mounting bolts (A) slightly, and move the door backward or forward, up or down as necessary to equalize the gaps. 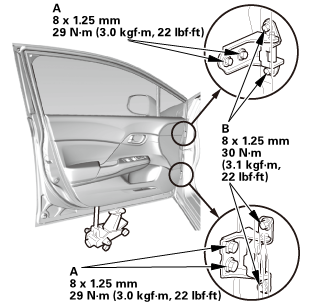 If necessary, replace the door mounting bolts with the adjusting bolts made specifically for door adjustment, then adjust at the door: Loosen the door mounting bolts (B) slightly, and move the door up or down as necessary to equalize the gaps, and move it in or out until it's flush with the body. NOTE: Refer to the Parts Catalog if you need use an adjusting bolt. Place the front fender fairing (A) as shown. 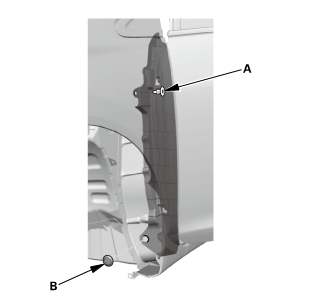 Install the hooks (A) of the front fender fairing (B) to the body holes as shown. 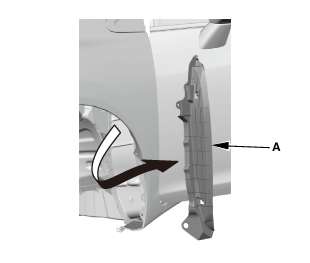 From the wheel arch, install the clips (A, B). Front door: Install the front inner fender as needed (A). Aiming should be done in a well-lighted area. There should be no bright objects at the back of the target (sunlight, windows, illumination, or reflectors) or design similar to the target pattern. If the aiming procedure fails, try changing the lighting to make it lighter or darker to see if the current lighting is affecting the aiming. LaneWatch camera aiming should be done on a flat place. 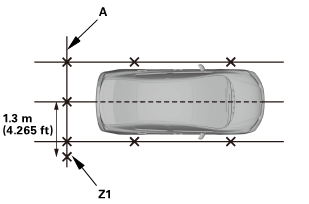 Park the vehicle on level ground in a wide open area to avoid any reflection from objects that could affect the alignment procedure. 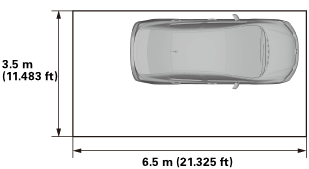 Make sure you have at least the following amount of space around the vehicle: 6.5 m (21.325 ft) in length, 3.5 m (11.483 ft) in width. 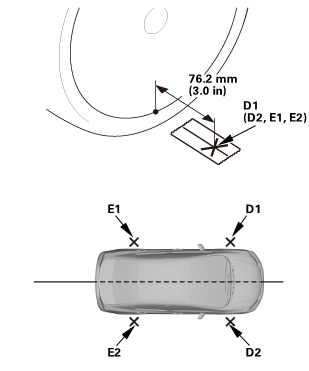 Do the aiming in a proper place where you can obtain the about 4.5 m (14.764 ft) distance between a target pattern and the vehicle (from the center of the front wheel hub). Make sure the suspension has not been modified. Make sure all the tire sizes are correct and that their pressure is correct. Make sure the fuel tank is full. Remove all cargo from the vehicle except the tool kit. Make sure the steering wheel is pointed straight ahead, and do not turn it after setting the vehicle. With the transmission in P or N, and apply the parking brake. 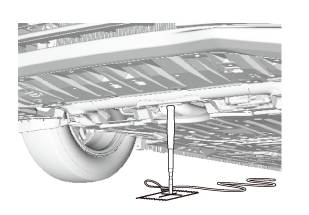 To aim the LaneWatch camera, you need 3.5 m (11.483 ft) of open space behind the rear bumper and 2.5 m (8.202 ft) of open space on the passenger's side of the vehicle. Make sure there are no other objects except the aiming target in this area. Check the tire pressures, and adjust them to the specified value if needed. 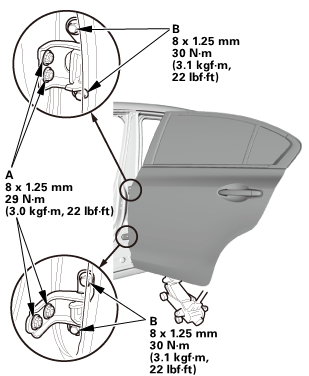 Put a person or an object equivalent to the driver's weight in the driver's seat. NOTE: When marking on the floor, use suitable tape to mark the exact locations. 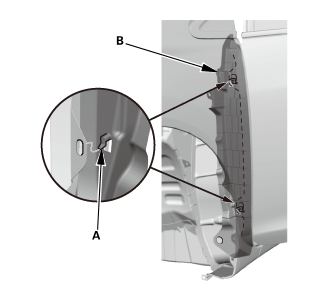 At the front of the vehicle: Place the centering stand under the line (A) on the front jacking bracket, then mark the spot (B) at the centerline of the centering stand. 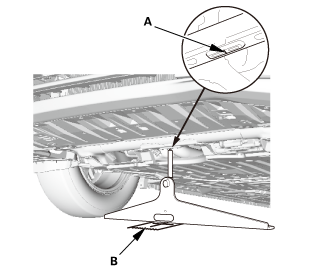 At the front of the vehicle: Place the gas strut holder between the front jacking bracket and the mark on the floor. 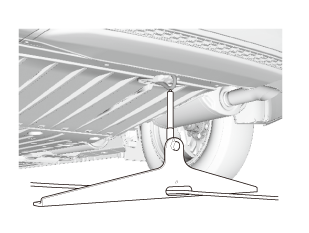 At the back of the vehicle: Place the centering stand under the rear jacking bracket, and run the cord through it. 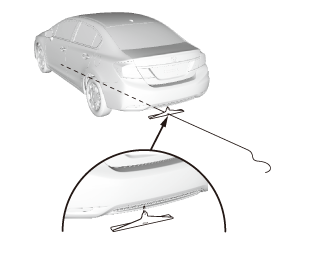 Attach the cord to the stand, placing the stand about 2.0 m (6.562 ft) behind the vehicle. NOTE: Make sure the rope is taught and not laying on the ground, then align the cord in the center of the centering stand. 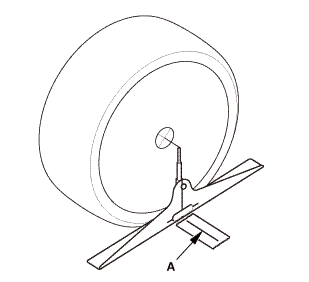 Find the center of one wheel (A) using the centering stand and mark it. Measure the 76.2 mm (3.0 in) from the edge of the rim, and mark a second mark (D1) that intersects the wheel's center line. NOTE: Repeat this step for each wheel (D2), (E1), and (E2). 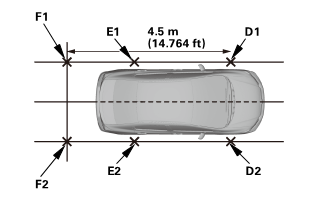 Measure, and place a mark (F1), (F2) on the floor 4.5 m (14.764 ft) behind the center of both front wheels (D1), (D2). NOTE: Make sure the line intersects the mark that was made for each rear wheel (E1), (E2). Lay a tape measure (A) across the two marks that you made in step 11. Make a mark (Z1) 1.3 m (4.265 ft) from the center line on the passenger's side. Leave the tape measure on the ground. 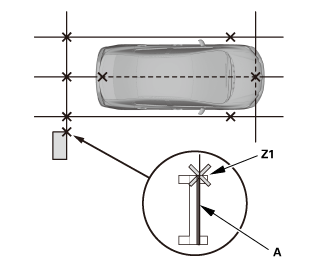 Set the LaneWatch marker (A) to the LaneWatch aiming stand (B), and adjust the height of the LaneWatch marker. 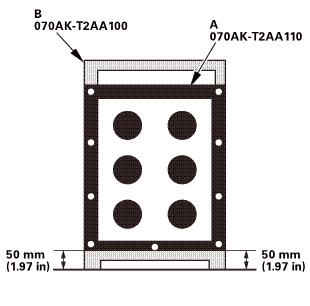 Position the target (A) by aligning the edge of the target with point Z1 as shown. When you stop the aiming procedure, turn the ignition switch to LOCK (0), or press the engine start/stop button to select the OFF mode. If you press the LaneWatch switch while in the aiming mode, clear the current aiming data. Turn the ignition switch to ON (II), or press the engine start/stop button to select the ON mode. Press and hold the POWER, EJECT, and HOME buttons for about 3 seconds until the Select Diagnosis Items screen appears. Select Detail Information & Setting. Select LaneWatch and Aiming Start. Press the LaneWatch switch button on the end of the turn signal switch to aim the camera. Wait until the aiming process is complete, and the display returns to the LaneWatch camera image.